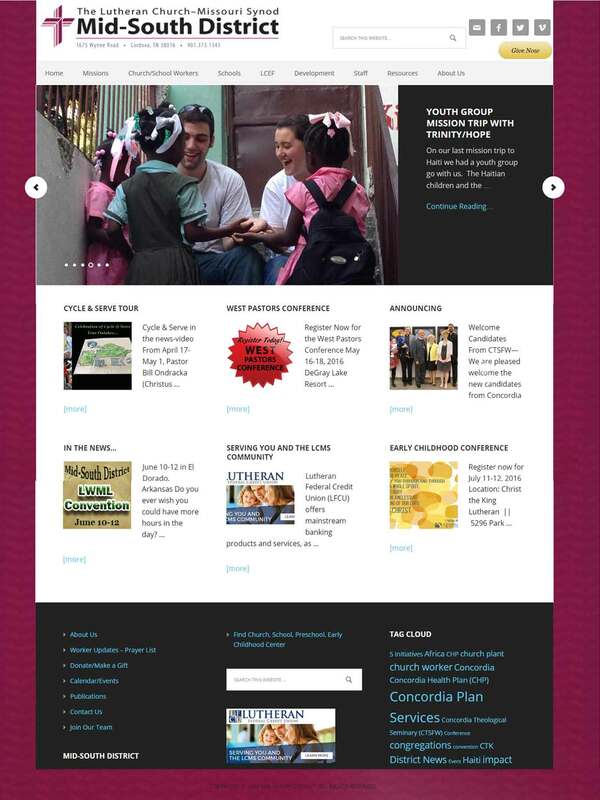 The Mid-South District of LCMS needed a redesigned website to improve user experience and navigation. They also wanted the structure to reflect their five initiatives. Photos were to be prominently featured on the home page and throughout the website. A bold, clean and tailored look and feel was also requested. Articles and information would change each week and social media channels needed to be easily accessed along with a donation button. Additionally, Silver Cricket Designs provides web maintenance, updates the weekly stories, designs and distributes their monthly newsletter, creates the online registration for conferences and regularly posts as an admin on their facebook page. The navigation was improved by following their IMPACT initiatives as requested. An image rotator with story introduction was featured under the navigation and the link takes the reader directly to the story. These images and stories change monthly matching their focus of the month from their monthly newsletter. Additional information and stories are featured in the middle section of the home page. Social media and the Give Now button are prominently featured. Their users have given positive feedback at the ease to find information and enjoy the consistent changing of the photos and stories from around the district.